Use this template dynamically with Proggio! Application development includes a lot more than writing code. Yet, jumping into the coding lines is a common mistake that tends to result in time loss, and mismatched requirements and implementation. This template suggests a process that starts with application definition and ends with a user test. The template spans a six-month plan, but the actual duration varies according to application size and complexity. 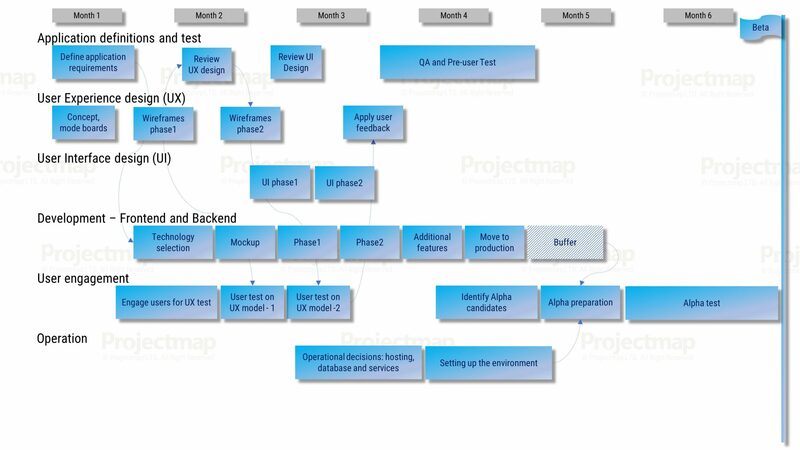 It is highly recommended to break down the project development process into phases and to refer to these phases throughout the management process, for example – UX, UI, Development and sometimes a user test. Breaking down the scope of the project provides quick feedback on ongoing work and allows for changes to be made before the entire project is out. Definitions and tests – good implementation must start with detailed requirements, otherwise we don’t know what to build, why, when and how to test it. Requirements are documented to avoid misunderstandings, misconceptions and to ensure data preservation. The test plan is developed based on defined features. UX and UI – never count them as one! UX translates the requirements into the project’s wireframes, without the final graphics (UI). UX involves refinement of project requirements to make it more relevant and understandable to users. The UX process ends with a user test before any UI work is done. Only after real users approve the UX design does the UI process kickoff. Development – this template shows the development integration but does not specify how the code writing is managed (preferably with Agile methods). The process starts with technology exploration and decision making, based on the requirements. It then continues on to mockup, which requires basic wireframes but does not require any UI design. The development process should also follow several phases, so the outcome can be tested as soon as possible. As long as the user test with the UX model is not completed, it is important to continuously focus on mockup and technology challenges. Once verified with real users, part of the application features can be released to development knowing that from this point, big changes are unlikely. The development process is also a good time for buffering management, to make sure the alpha release will be on time. User engagement – should be managed as early as possible. Relevant alpha candidates can also be the test users, as long as they are not exposed to the application during development. Successful user testing of a UX model and alpha testing with real implementation will increase the confidence in the application’s usability and ensure project success. Operation – cloud services or on-site resources – the application should have a stable platform to run on and the relevant personnel to maintain it. Picking Your Project Management Software With a 3 Point Checklist. Compatibility, the Must! What Should PMs do to “Be Compatible”? Sending a man to the moon in 6 months? Yes we can’t! ©2017 Projectmap. All rights reserved.